Perfect for your next family dinner, these whole wheat dinner rolls are going to free up your oven, because they’re made in a slow cooker! 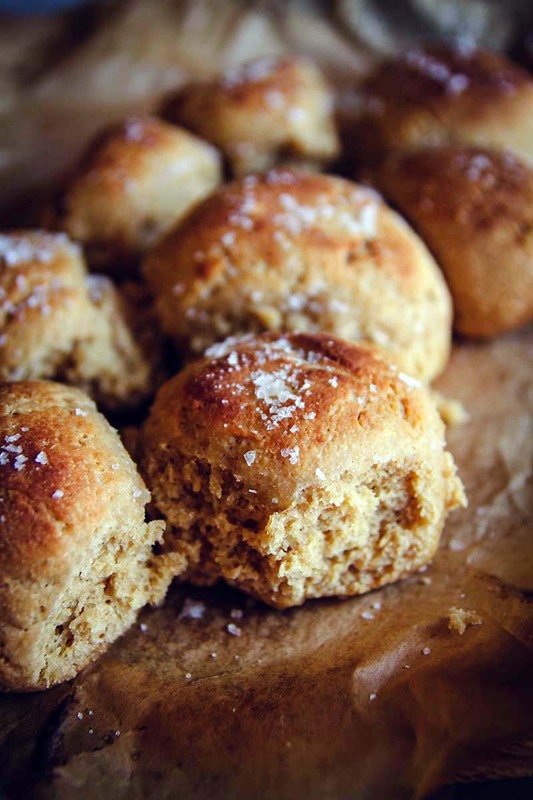 Everyone will love these delicious hearty whole wheat dinner rolls with a wonderful flavorful, and you’ll love how easy they are to make. Start by warming the milk in a microwave-safe cup. Add yeast to the milk, stir once or twice and then let sit for 5-10 minutes until it is foamy. Pour yeast mixture into a large mixing bowl and add in the honey, sugar, melted butter and salt stir with a wooden spoon until combined. Next add whole wheat pastry flour. Stir until the dough comes together. It will be a slightly wet and sticky dough. Divide dough into 12 equal-sized pieces. Form them into balls. Line a slow cooker (that is large enough to hold 12 rolls) with parchment paper and spray lightly with cooking spray. Place the dough balls in the slow cooker, on top of parchment paper. Put a big piece of paper towel under the lid (important step, you don’t want the condensation dripping onto your dough) and cover the slow cooker. Turn on high and cook for 90 minutes. Check for doneness - the middle ones should be cooked through on the bottom and the outside ones should be slightly browned. Lift the parchment paper out of the slow cooker and transfer to a baking sheet. Bake rolls under the broiler in your oven (or oven at 500°F) for 2 minutes. Brush with butter and sprinkle with garlic salt and sea salt. Serve warm. Recipe created by Sweet Phi.